[By Charles G. Clarke, ASC - 1967] As some confusion exists about the title director of photography, perhaps a brief summary at this time would be in order. Since the inception of the movies, there have been cameramen. Then, as the peculiar technique of cinema was developed, the cameraman became the cinematographer. As the industry progressed, cinematography took on specialized fields. The cinematographer now devoted more of his talents to composition and lighting and left the mechanics of the camera to members of his staff. Today he directs and supervises the efforts of a large crew of workers, and is known as the director of photography. He selects the composition, sets the exposure, conceives the lighting, and designates the filters or other photographic controls to be employed. In the INTERNET ENCYCLOPEDIA OF CINEMATOGRAPHERS you'll find the biographies and filmographies of hundreds of international cameramen and camerawomen. > Each entry provides you with the following information: PERSONAL INFORMATION [photo; date, place and country of birth; education; career and awards], FILMS [feature films, shorts (= productions up to 60 minutes) and documentaries], TELEVISION [films, specials, pilots and (episodes of) series], FILMS AS CAMERA ASSISTANT AND/OR OPERATOR, FILMS AND/OR TELEVISION AS DIRECTOR and MISCELLANEOUS. > The films are arranged in the order in which they were FILMED [not the year of copyright or release]. However, those filming dates are not always easy to find. The order in which the films are arranged will probably change in the future as more information will become available. > A number of publications and websites announce film projects in development or pre-production. 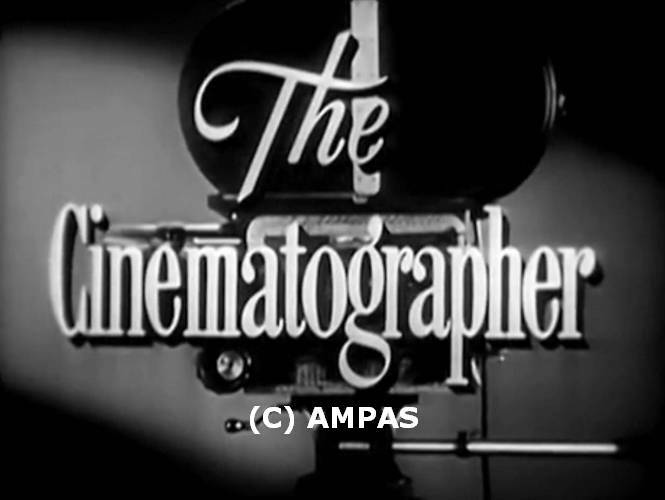 When it is not totally clear if the film has been produced, if the scheduled cinematographer has really photographed the picture or when other essential information is not available, the entry will appear in red. > With each film the 'collaborating' and/or 'specialized' camerapersons working on the production are also mentioned. These data are only listed in the filmography of the 1st unit cinematographer, i.e. the cameraperson who is ultimately responsible for the 'look' of the film. > All information is in English. Next to the original title of the film you'll find alternative titles and the English and/or American title. > For reasons of space a lot of information in the filmographies is abbreviated. Each entry has a 'link' to the list of ABBREVIATIONS [ABBREV]. > Accents in film titles and the names of people will only be used if they can be typed with a 'normal' keyboard without using the possibility of 'special signs/letters'. So, you will see ü, ç, à, é, ã, û, etc., but not the specific accents used in e.g. East European languages. DISCLAIMER - All photos on this site are reproduced strictly for informational purposes. Some photos are submitted by the cinematographers. A growing number of photos are frames from filmed interviews and/or documentaries. And there are publicity stills. If we know the name of the photographer, he or she will be credited. A minority of the photos come from different sources on the internet. We try to contact the photographer to get permission. It's not our intention to infringe on someone's rights. If you are the photographer [or his/her representative] and hold the legitimate rights to any of the photos and object to the publication on this website, please inform the We will remove the photo immediately or look for another solution. The photos are watermarked IEC. However, that doesn't mean that we claim any rights. The watermark makes it only more difficult to copy the photo. The editor of the IEC welcomes additions and corrections to the filmographies and the other pages in the INTERNET ENCYCLOPEDIA OF CINEMATOGRAPHERS. Your suggestions are also appreciated. CLICK HERE! 100+ international cinematographers [from the past] who have made a significant contribution to the development of the art and craft of cinematography. You'll find them in the A-Z index. Look for the prefix 100. > Margreet Suzanne Vanderhoeven for her love and support. > The many cinematographers who submitted their photos and additions & corrections. > Shawn Martin for his many corrections & additions. > John L. Seitz for sending photos and other information on his father, cinematographer John F. Seitz. > Some photos courtesy of William Kallay & Michael Coate [from their website From Script to DVD.com]. > Thys Ockersen from Thys Ockersen Archive/Thys Ockersen Films for his photos. > The American Society of Cinematographers/American Cinematographer [David Williams] for numerous photos. The IEC website will NO LONGER be updated regularly.